Lee Filters 72mm STANDARD Adapter for FOUNDATION KIT. Lee Filters 49mm WIDE ANGLE Adapter for FOUNDATION KIT. Lee Filters 82mm STANDARD Adapter for FOUNDATION KIT. Lee Filters 62mm STANDARD Adapter for FOUNDATION KIT. Lee Filters 72mm WIDE ANGLE Adapter for FOUNDATION KIT. Lee Filters 77mm WIDE ANGLE Adapter for FOUNDATION KIT. LEE Filters LEE100 Filter Holder. Will be compatible with existing 105mm polarisers via the new LEE100 105 polariser ring. Lee Filters holder for the 100mm system has been redesigned after listening to photographers. Lee Filters holder for the 100mm system has been redesigned after listening to photographers. Compatible with existing 100mm filters and adapter rings. Lee Lens Adaptor Ring for Canon 17mm TS-E.
Lee filters Wide Angle lens hood with one slot. The Lee Wide Angle Filter Hood is a filter holder with a built-in compendium lens shade. It accepts one 100 mm wide and 2 mm thick filter. The self-supporting, compendium-style bellows expand to the required position without using guides or rails. 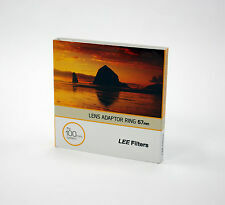 Lee Filters LEE100 Landscape Kit This is a perfect starter kit to start landscape photography. Also included is the latest filter holder with a locking dial to keep the holder and filter securely in place. Also included is a cleaning micro fiber cloth from Terrascape. The polariser ring included will be compatible with your existing 105mm polariser. Lee Filters 100mm system is a much improved version of the now retired foundation kit. This is a perfect starter kit to start landscape photography. Lee Filters SW150 Mark II Holder. Lee Filters have launched the SW150 Mark II a new system for a wider range of ultra wide lenses. This system enables photographers who own such lenses to now use a big stopper, little stopper and polariser. The Foundation Kit is at the centre of the LEE Filter holder system and is primarily designed to take standard 100mm filters. Lee Filters Foundation Kit. The holder is supplied in component form to allow you to construct a filter holder to your individual needs. Enables use of smaller 100mm system including the Big Stopper. We will always help you to have a 100% positive happy buying experience. Lee Filters LEE100 Long Exposure Kit [100LEK]. LEE100 Holder, latest version with a locking dial to stop the rotation. Very useful when setting up the stoppers. 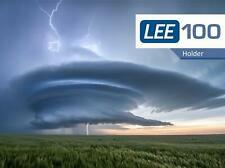 LEE 0.6 ND Grad hard. Big Stopper. Little Stopper. LEE 49mm Standard Adapter Ring. Compatible with the LEE100 Holder and the foundation kit. The adapter is a compulsory item to get if you want to use the LEE 100mm system. The standard adapter ring is suitable for use with lenses up to a moderate wide angle. LEE Filters Seven5 Adapter Ring. For the Seven5 series Only. Thread Size: Fuji X100(S). The adapter ring is crucial to the Lee Filters system. The adapter ring screws onto the lens with a fluid action and has a sturdy construction and aluminium screw thread. This SW150 adapter from Lee Filters is used in conjunction the SW150 Holder. Lee Filters SW150 Adapter Tokina 16-28mm. Each adapter includes of a front ring, a compression ring and a locking ring. LEE 77mm Wide Angle Adapter Ring. For lenses with a 77mm thread. Example of lenses with 77mm thread. The adapter ring is crucial to the LEE Filters system. The wide angle adapter ring is suitable for use with wide angle lenses. Good condition, working order genuine part. Original LEE filter mist stripe in mint condition. This SW150 adapter from Lee Filters is used in conjunction the SW150 Holder. Lee Filters SW150 Adapter Nikon 14-24mm. Each adapter includes of a front ring, a compression ring and a locking ring. Holder for 100mm Lee Filters. Others Listed. This is the filter holder for use with Lee Filters system. You will also need the correct lens adapter to fit it to your lens. It is in good, used condition. This Lee Adaptor allows the SW150 MK II to be mounted on the Tokina 16-28mm Lens. We will always help you to have a 100% positive happy buying experience. Lee Filters Hasselblad B70 Adapter for FOUNDATION KIT. 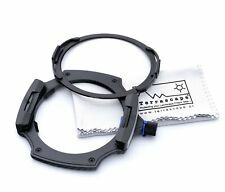 Lee Adaptor Rings fit onto the lens to accommodate the filter holder or lens shade. Sturdily constructed with an aluminium screw thread, this is a STANDARD adaptor ring for Hasselblad lenses with Bayonet 70. This high-quality adapter ring from LEE has been specifically designed to fit the popular Olympus 7-14mm f/2.8 PRO lens. The adapter is quick and simple to fit to the Olympus lens and allows the user to attach any SW150 System filter and holder (not included). This high-quality adapter ring from LEE has been specifically designed to fit the popular Olympus 7-14mm f/2.8 PRO lens. The adapter is quick and simple to fit to the Olympus lens and allows the user to attach any 100mm System filter and holder (not included). With this adapter ring you can attach the Lee SW150 mark II holder and filter system to an ultra-wide angle lens that features a 72mm threaded filter ring. Each adaptor consists of a front ring, a compression ring and a locking ring. A used Lee Filters 62mm adaptor ring in good condition. Lee Adaptor Rings screw onto your lens to accommodate the filter holder or lens shade. Sturdily constructed with an aluminium screw thread, this is a wide angle adaptor ring for lenses with a 77mm filter thread. Lee Filters 49mm Lens Adapter Ring. Other Sizes Also Listed. This is a filter holder for use with Lee Filters. Lots moreLee & Other Filters listed. 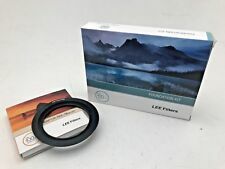 This is the Lee Filters adapter ring to connect your lens to the Lee Foundation Holder ( not supplied ) and start using filters to enhance your photography. Amongst the many products lines we carry are Lee Filters, Formatt Hitech and Heliopan filters, easily one of the most extensive and varied range of filters and accessories in the U.K.
Lee Filters SW150 Mark II Light Shield. Lee Filters have launched the SW150 Mark II a new system for a wider range of ultra wide lenses. Give the lightshield the best chance to work correctly when shooting in bright conditions. 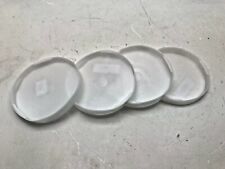 Original LEE sky blue filter set, still in manufactures seal. 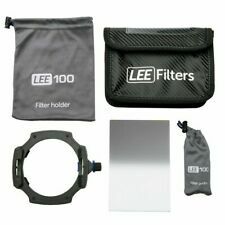 Lee Filters LEE100 Deluxe Kit has everything a photographer will need for landscape photography, from long exposure to seascape. Enhanced with the addition of the LEE100 holder. The polariser ring and the polariser are now one unit. Lee Filters LEE100 Landscape Kit Includes a 77mm wide angle adapter ring. This is a perfect starter kit to start landscape photography. Also included is the latest filter holder with a locking dial to keep the holder and filter securely in place. LEE Filters Seven5 Adapter Ring. For the Seven5 series Only. Thread Size: 49mm. The adapter ring is crucial to the Lee Filters system. The adapter ring screws onto the lens with a fluid action and has a sturdy construction and aluminium screw thread. Lee adapter ring designed for use with wide or ultra wide lenses. We will always help you to have a 100% positive happy buying experience. This SW150 adapter from Lee Filters is used in conjunction the SW150 Holder. Lee Filters SW150 Adapter Nikon 14mm. Each adapter includes of a front ring, a compression ring and a locking ring. Fits over the LEE filters 100mm system lens rings. We will always help you to have a 100% positive happy buying experience. 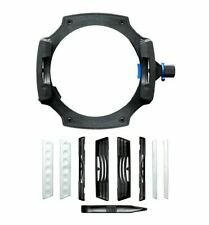 With this adapter ring you can attach the Lee SW150 mark II holder and filter system to an ultra-wide angle lens that features a 77mm threaded filter ring. Each adaptor consists of a front ring, a compression ring and a locking ring. LEE Filters Seven5 Adapter Ring. For the Seven5 series Only. The adapter ring is crucial to the Lee Filters system. The adapter ring screws onto the lens with a fluid action and has a sturdy construction and aluminium screw thread. LEE 58mm Wide Angle Adapter. For lenses with a 58mm thread. The adapter ring is crucial to the LEE Filters system. The wide angle adapter ring is suitable for use with wide angle lenses. As a result, the likelihood of vignetting is dramatically reduced. Clear LEE Filter Wash is specially formulated to cut through dirt. Safe to use on every filter in the LEE Filters range, it removes everything from greasy marks and fingerprints to salty residues safely and effectively. Lee Filters 77mm STANDARD Adapter for FOUNDATION KIT. Lee Adaptor Rings fit onto the lens to accommodate the filter holder or lens shade. Sturdily constructed with an aluminium screw thread, this is a STANDARD adaptor ring for lenses with a 72mm thread. LEE 62mm Wide Angle Adapter. For lenses with a 62mm thread. The adapter ring is crucial to the LEE Filters system. The wide angle adapter ring is suitable for use with wide angle lenses. As a result, the likelihood of vignetting is dramatically reduced. LEE 49mm Wide Angle Adapter. For lenses with a 49mm thread. The adapter ring is crucial to the LEE Filters system. The wide angle adapter ring is suitable for use with wide angle lenses. As a result, the likelihood of vignetting is dramatically reduced. Lee Filters 58mm STANDARD Adapter for FOUNDATION KIT. Lee Adaptor Rings fit onto the lens to accommodate the filter holder or lens shade. Sturdily constructed with an aluminium screw thread, this is a STANDARD adaptor ring for lenses with a 58mm thread. Lee Filters Olympus 7-14mm F2.8 Pro Adapter for FOUNDATION KIT. Lee Filters 100 Olympus 7-14mm F2.8 Pro Adapter Ring. Consists of a front ring, a compressor ring and a locking ring for the 7-14mm F2.8. Amongst the many products lines we carry are Lee Filters, Formatt Hitech and Heliopan filters, easily one of the most extensive and varied range of filters and accessories in the U.K.